The history of Saint Joseph's and Catholicism in Westphalia are forever linked as the parish and town were established together in 1835. Today our parish is the spiritual home to over 450 families who gather & grow in faith. The current pastor of St. Joseph's is Fr. Anthony Viviano. The original church was built in 1848 and has had several renovations over the years, but as we look at the state of this wondrous building around us, it is apparent she is in need of repairs. From the steeple, attic and roof, to the plaster, paint and pews, the list of repairs has grown and we have come upon a time where we have started looking at possibilities for the future. Our church is more than a foundation with walls and a roof. It is a legacy of faith to those that built it. It is in this spirit that we embark upon the “Restoring our Roots” Capital Campaign. For an update on the progress of the renovation or to find out how to donate, click on the RENNOVATION tab which can be found under CHURCH. Get your free membership to FORMED! St. Joseph and St. Anthony have generously gifted its parishioners with a free member ship to FORMED! 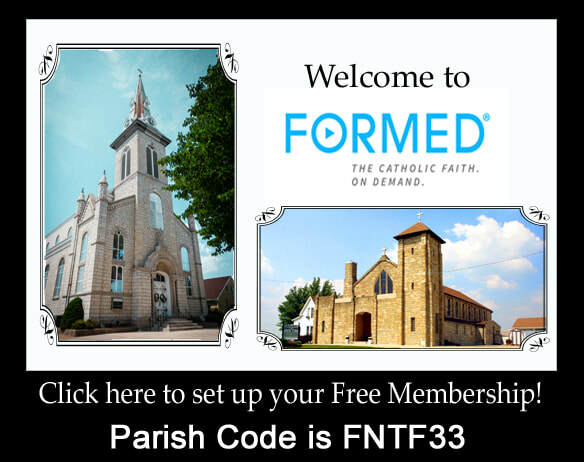 FORMED is a revolutionary online platform featuring the best Catholic videos, audio talks, eBooks and movies from trusted partners like the Augustine Institute, St. Paul Center, Marian Fathers, Lighthouse Catholic Media, Ignatius Press and Word on Fire. Catechism and Personal Faith Formation are at the fingertips of every parishioner. Click on the image below to set up your FREE account! WINE & SHRINE FAMILY click here. Lectio: Prayer // Promo from FORMED on Vimeo. For information on how to participate in the Lenten Study go to our FORMED AND FAMILY ACTIVITY PAGE and scroll down. St. Joseph currently offers 24 hour Eucharistic Adoration every first Friday of the month. There have been requests for Adoration to be made available more than once a month. Currently less than 5% of parishioners at St. Josephs participate. Those that do participate report on the numerous insights, blessings and spiritual growth this devotion has brought into their lives. The quote above from St. Pope John Paul The Great, seems to be possibly manifesting here at St. Joseph's. "Where the Eucharistic life flourishes, THERE THE LIFE OF THE CHURCH WILL BLOSSOM." As Father Viviano reported in his end of 2018 remarks after Mass on New Years, "Many people are reporting new spiritual growth and really great things are happening. The Spirit is definitely on the move here at St. Josephs!" If you have never tried Adoration or tried it and just don't understand it, we highly encourage you to give it a chance. FORMED has many resources about the gift of the Eucharist that our Lord gave to His Church. He promised to be with us always, until the end of the age. Our good Lord instituted the Eucharist help fulfill this promise. The God of the universe makes Himself into a humble , venerable piece of bread so we can have Him in the closest way possible during Holy Communion. Come and sit with Him, keep watch over Him in this venerable state. Treat yourself to a holy hour and enjoy some peaceful solitude in our noisy hectic world. Our God will not be outdone in generosity. What ever you give to Him he will give back to you, multiplied! Please sign up for a time on the sign up sheet located in the vestibule of St. Joseph Church. 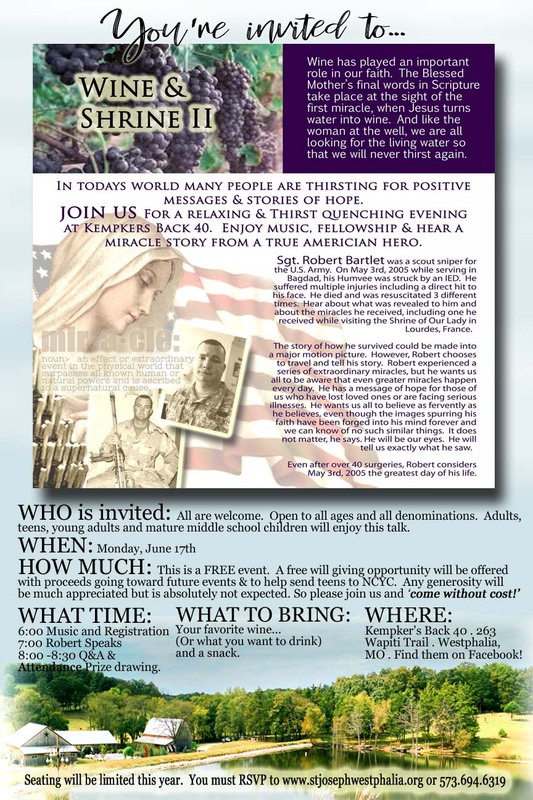 You do not have to sign up to participate and you are welcomed to come anytime Adoration is available. However, there always needs to be at least one person present, (2 is recommended) to ensure the Blessed Sacrament is protected against theft or harm in its venerable state. Can you keep watch with Him for one hour? If we do not have enough participants Adoration can not be offered. your time in adoration click here. How to Pray Like a Saint. Jesus and The Jewish Roots of The Eucharist.